Numark One-a-Day Multivitamins are suitable for the whole family from the age of 12 upwards. They are helpful for those on-the-go, who may not always have access to a balanced diet. 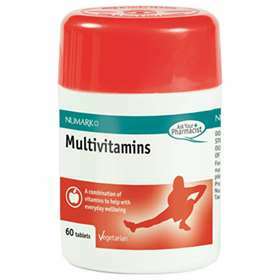 A multivitamin can also help support the body's recovery after illness. It is useful to combine this supplement with a pre and probiotic for those who have suffered with a tummy bug such as Optibac Probiotics Daily Wellbeing Capsules or Optibac Bowel Calm Capsules. Helps to maintain a balanced diet for busy people. Boosts vitamin and mineral levels after illness. Supports growth and helps to maintain a healthy metabolism. Free from Sugar and Yeast. Free from artificial flavours or perservitives. x60 tablets in a sealed plastic pot. This product should not be used as a substitute for a balanced and varied diet. However it may help in times of stress or in order to boost vitamin and mineral levels during recuperation after illness. Vitamin A 800µg, Vitamin D3 5µg, Vitamin E 12mg, Vitamin C 80mg, Thiamin 1.1mg, Riboflavin 1.4mg, Niacin 16mg, Vitamin B6 1.4mg, Folacin (Folic Acid) 200µg, Vitamin B12 2.5µg, Pantothenic Acid 6mg.